Join us each month for Career Crossroads, a look at how journalists, bloggers, and freelancers are adapting to the changes in their media careers. Catch up on previous installments at bit.ly/careercrossroads and access job opportunities and other free media tools on PR Newswire for Journalists. Journalism was recently dealt a blow. According to a study conducted by Georgetown University’s Center on Education and the Workforce, the unemployment rate among journalism and communications grads has increased, while the job market for degree holders in other areas, including architecture, social science, law and education, has improved. It’s not the best news for those hoping to break into the business, but if today’s journalism grads are anything like the Associated Press’ Erin Madigan-White (@emadiganwhite), the opportunities in journalism are endless. During her nearly 15yr career, Madigan-White has hopped from Wisconsin — where she covered local/state politics out of the statehouse bureau of the Milwaukee Journal Sentinel — to Washington, DC, to work for public policy news website Stateline.org and the National Journal. She then finally landed in the media capital of the world, New York, at the Associated Press. When she moved to National Journal to be an editor for their website, it opened up a new path on her journalism journey. “It allowed me to further dig into digital media at a time when it was really taking off.” It also prepared her for her next job on the digital team at the AP. Suddenly she was helping to launch AP’s first mobile app and producing websites for two Olympic Games in Beijing and Vancouver. She never guessed she would be working on such projects. Despite her success working on AP’s digital and mobile initiatives, her love for writing and storytelling never wavered. Though she was no longer reporting, she was still spending a lot of time in the newsroom working with AP subscribers while also participating in a professional development program at AP that provided a window into the corporate side of the business. 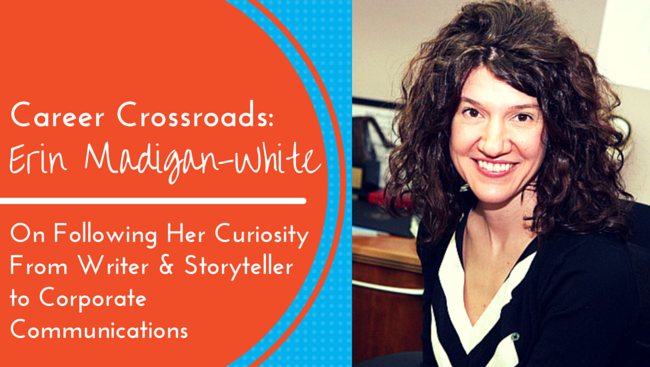 When an opening in the media relations department became available, Madigan-White decided to hop the fence over to corporate communications. She says the skills she gained as a reporter were enormously helpful when deciding how to pitch a story or respond to an inquiry or manage a crisis. It also helped her establish a mutual trust and respect with reporters and producers. So, to those journalism graduates and even current working journalists who may be feeling discouraged about the media industry, Madigan-White offers a bit of advice. You never know where your journalism degree and experience may take you. Have an interesting story to share about your media career? Beyond Bylines’ Career Crossroads series features stories and job advice for journalists from journalists. Tell us your story by emailing media.relations@prnewswire.com. You can also catch up on the latest media moves by following @PRNmedia on Twitter. Brett Simon is PR Newswire’s director of audience relations. Follow her @savsimon.